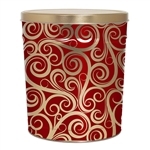 Giving a decorative popcorn tin is guaranteed fun for giver and recipient alike. It’s a personalized and surprising treat that is always appreciated. We recommend our tins for anniversaries, care-packages for college students, or for business owners to show appreciation to their clients and employees. Choose our popular platinum tin (with the Coastal Maine Popcorn logo) or a holiday themed tin. Choose from our 40 Flavors!